Chicagoans will be sitting down to sample the best fall flavors around the Thanksgiving dinner table this week. 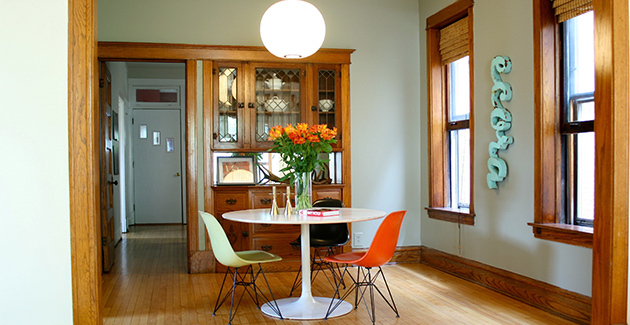 If you’ve dreamed of playing host but your current place doesn’t have enough room to host an honest-to-goodness dinner party, then you might want to check out these Chicago apartments with great dining rooms. Some apartment buildings come on to Chicago’s renowned architecure scene with a big splash, and One Bennett Park is definitely among those grandiose entries. This spectacularly tall building rises above the lakefront, providing residents with great views of Lake Shore Drive, Navy Pier, the Chicago River and Ohio Street Beach. All of the scenery can be indulged from the dining rooms, making dinner table conversation a cinch for anyone who wants to marvel at Chicago’s iconic skyline from this lofty perch. Apartment renters who are looking for stylish apartments in the Gold Coast neighborhood should make sure they scope out Aurelien Apartments. These crisp and contemporary living spaces are in a building that’s chock full of amenities (the view from the rooftop pool is a stunner) but the units are just as carefully considered. People tend to gravitate towards the kitchen in almost any home, and the large kitchen islands featured in these apartments serve as a great anchor point while making meal prepping and set up a breeze. 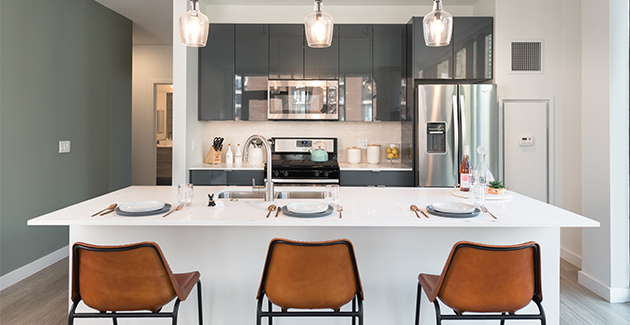 One of the newest apartment buildings in the Uptown neighborhood offers renters the best in modern appliances and a space to appreciate the high-powered kitchen gadgets. 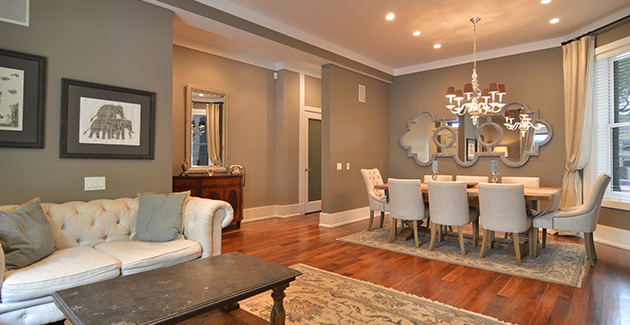 The open floorplan leaves ample space for a dining room. The apartments also boast unbeatable views of Chicago’s lakefront. 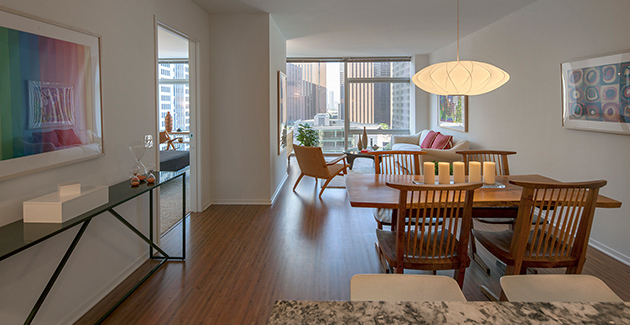 The floor-to-ceiling windows let renters appreciate all the natural beauty of Lake Michigan while bathing the apartments in spectacular natural light and providing a dramatic backdrop for any feast. Living in such close proximity to the fabulous restaurant scene of River North can provide endless inspiration for an ambitious home chef. 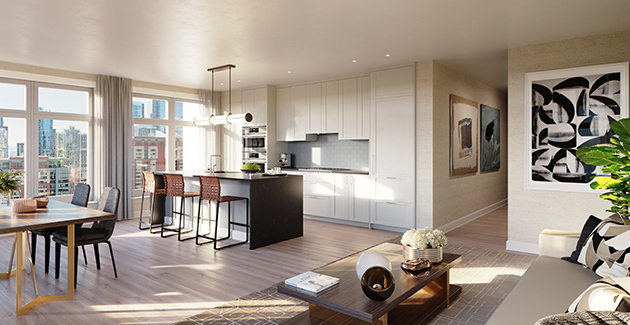 And for people who love cooking, it’s tough to imagine a more inspiring and elegant setting for preparing meals than the kitchens in The Hudson Apartments. 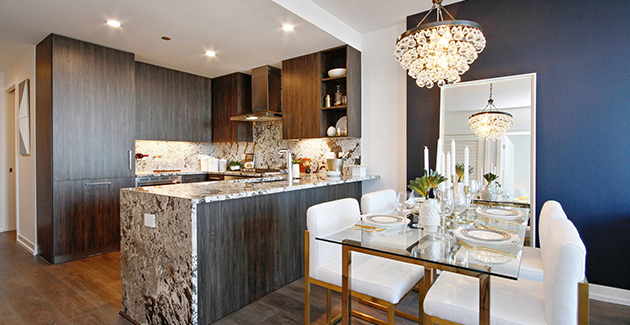 Waterfall countertops and integrated Bosch appliances will delight anyone who loves to cook, and the comfortably chic apartments provide a great space to host guests over the holidays. This historic home dates back to the Chicago Columbian Exposition, so it comes with a host of vintage charms. The built-in hutch in the separate dining room still bears classic details like ornate glass cabinets and the hardwood accents provide a sense of warmth throughout the home. This cozy gathering place for the holidays is perfect for history buffs! The classic exterior of this Victorian style rowhouse in Linclon Park has tons of curb appeal, but renters will love relaxing in the updated interior of this spacious apartment. One of the surprising highlights of the totally renovated interior is the whole house audio system. Feel like curating a playlist for the perfect dinner party? Then this is the spot for you! 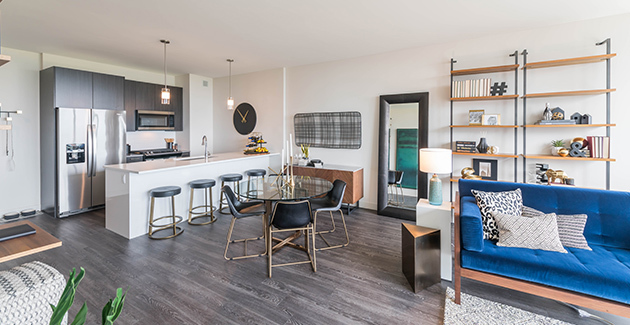 The Aston Chicago Apartments offer great location for bringing people together and showing off some spectacular views of the skyline in the process. But the real charm of living in this Streeterville building is that even 1-bedroom floorplans accommodate dining rooms. Having a meal with people matters, and the architects behind this modern high-rise apartment building clearly understood that during the design process.